Casein and Caseinate Market Segmented By Key players Nestlé S.A., Danone S.A., Arla Foods and Groupe Lactalis. Friesland Campina.,Fonterra., Westland Milk Products., Groupe Lactalis.,Saputo., Other. The report on the casein and caseinate market delivers valuable insights on how the said market will progress in the near future, with the period of evaluation being 2017 and 2025. The report is a useful instrument for casein and caseinate manufacturers globally as the projections shared in the study can help them make informed business decisions with respect to investing in novel production techniques, cost-effective procurement of raw materials, and penetration into new markets beyond domestic market. The making of the report involved collaborative research methodology to obtain data from multiple sources. The data obtained has been scrutinized employing a multidisciplinary approach that traces the evolution of casein and caseinates, links consumer requirements to demand for casein and caseinates, and offers presumptions on how this demand will evolve in the upcoming years. Supply chain of the global market for casein and caseinates has been split and examined to identify the challenges. In addition, analysis of the casein and caseinate market with respect to consumers reveals the impact of micro, macro, and socio-economic factors on the demand for casein and caseinate. The research process involved two extensive phases, namely primary and secondary. Secondary research phase involved gathering data to obtain a high level of intelligence of the market. Following this, the data collected in secondary phase is used in primary research to validate the credibility of the data. Thereafter, the data undergoes several rounds of accuracy validation until the research concludes. The final data related to market segments reflects close to 100 percent accuracy that depicts an accurate market scenario. 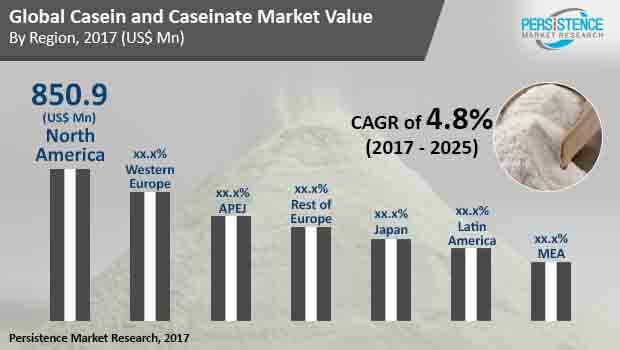 The expansion of the global casein and caseinate market has been predicted across multiple geographies. The section throws light on distinct buying trends between consumers in developed economies and developing economies. The report provides projections on the lucrativeness of a region, which has been obtained by identifying their value with respect to sales, outsourcing, product development, and production. Regions that exhibit high profits for manufacturers of casein and caseinate have also been identified. The report also contains a multicultural regional analysis of the casein and caseinate market. Key players in the global casein and caseinate market have been profiled to assess the competitive landscape. Details on competitive outlook is of great value for casein and caseinate manufacturers vying to outperform their rivals. The competitive landscape covers established market players, industry leaders as well as new market entrants. The objective of the report is to provide manufacturers with first-hand information on key competitive strategies that can help them gain competitive advantage. The report aspires to serve as a credible business document that can help casein and caseinate manufacturers plan their future growth strategies. The global casein and caseinate market is anticipated to expand at a steady pace in the upcoming years. Casein is a type of protein which akin to other proteins helps build and repair tissues. Commonly found in mammalian milk, casein is often marketed as an alternative to another common dairy-based protein- whey protein. Casein obtained either from food or from a supplement could be a useful addition to the diet with several potential benefits. Sometimes referred to as ‘the other protein’, casein is a rich source of long-lasting amino acids and is an easy-to-digest source of protein similar to whey. But casein is different from pea protein powder, whey protein, and even whole foods such as eggs and chicken breast. How? One of the greatest advantages of casein is its slow-digesting speed. The slow digestion speed of casein and caseinate may require up to seven hours to digest that prolongs lingering in the body. These two factors collectively make casein beneficial to build muscle fat and preserve the body’s lean muscle tissue. In general, nutrient timing is important which depends on the source and type of nutrient consumed. Casein protein, for instance, hits the blood stream very quickly, plus amino acids in casein stay where they need to be to help build muscle tissue for several hours, as opposed to being expelled from the body relatively quickly. Hence, individuals looking to strengthen lean muscle mass, control hunger, and obtain more benefits from exercise may consider opting for casein protein. Considering the number of factors driving adoption of casein and caseinate, the casein and caseinate market is predicted to clock a CAGR of 4.8% for the forecast period between 2017 and 2025. Across several parts of the world, food safety regulations bode well for the casein and caseinate market. In the European Union, strict food labelling statutes are also acting in favor of the casein and caseinate market. The labelling of casein and caseinate requires cation(s) to be mentioned and mixtures need to mention the constituents that it contains. The name and address of the manufacturer, packager, or seller is also a mandate of food safety requirements in the European Union. In China, strict regulations mandate all dairy product manufacturers to be registered with the Chinese government. A new requirement mandates these companies to hold a certificate of analysis for all first-time shipments. In Australia and New Zealand, the component of milk is regulated by the Food Standards Code. Milk for retail sales is required to contain at least 3.3% fat 3.0% protein, whereas skim milk is required to contain maximum 0.15% fat and minimum 3.0% protein. Among the various types of casein, industrial casein hold dominance in the overall casein and caseinate market owing to myriad industrial applications of casein. Among the key applications of casein and caseinate, food and beverages is predicted to hold the leading market share in the years ahead. Region wise, North America stood as the leading regional market for caseins and caseinate in the recent past; the region is anticipated to hold on to its dominant position in the upcoming years mainly because of high demand for protein-enriched foods. Arla Foods and Groupe Lactalis.